YOU CAN ORDER ONLINE but * Web Site "can not" calculate 25% off sale price. The automatic email confirmation of your order will not reflect the sale prices. You will be billed and invoiced with the sale prices upon final shipment. Indicate "Code # 99" in "Comments Section" before you check out to guarantee sale price. No extensions will be made. *Off retail prices listed. Not good in conjunction with other promotional offers. PLUS Mega Minerals are now back in stock (see page 2 of View All Products on web site). Sale on all products except Gift Sets & Gift Certificates . Florida residence 6 % sale tax. Body Products with Organic Goat Milk does your Body Best! The products will be featured on TV in 8 countries of Africa.... Via Africa Direct Shopping in the near future. Nutra-Lift Body Products with Organic Goat Milk does your Body Best! 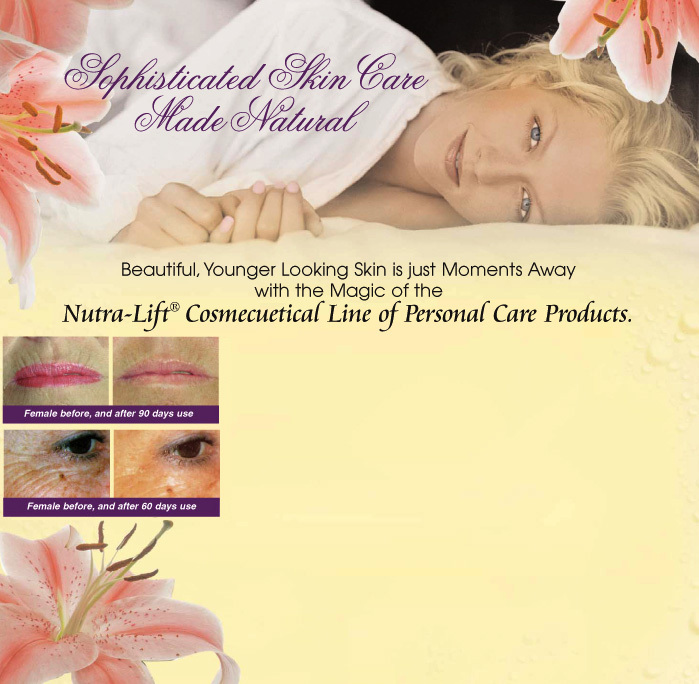 Why Nutra-Lift® is your Best Choice in Skin Care ! Department Stores without the overhead, marketing & retail store location costs passed down to you..
the best of Natural & Organic ingredients by keeping them stable & active, then delivering them into the inner skin for maximum results. 4) Clinically proven products by renown Doctors & Research Institutes. 5) Nutra-Lift® products contain No Heavy Oils that block the skin from breathing and the Nutra-Lift® will not clog pores. 6) Specially designed One Step products to save you Time & Money. bring you New and even Better products. proply & methyl parabens and ingredients you simply can't pronounce or even worse, identify. We use plant derived ingredients. integrity of each and every one of our products. Remember, our skin care is not full of heavy oils & synthetic chemicals. Instead it offers organic vegetables, organic fruit and active, key clinically tested cosmeceutical ingredients for exceptional results! "the Perfect Gift for Any Occasions"
Nutra-Lift is the best product I have ever used. I started using the One Step in my forties. I had skin very badly damaged by years of sun abuse and products with petroleum and harsh ingredients. I remember the first day I tried it. It felt tingly and tight but nice. Within a few days my skin had a noticeable improvement. Now years later I use the "Rejuvenating A" under the One Step. My skin has not aged in years, it's firm, tight and free of wrinkles. I live in a small town and once weekly we have a senior day where all residents over 55 years old get 10% off all groceries. I get a big kick of going through the cash registers of new employees. They always want to see my I.D. When they see I have since passed the 55 mark they are amazed. Thank you Nutra-Lift for making such wonderful products that don't cost hundreds of dollars. Elaine M. Valdez Ak. Here is a review of what our customers say about Nutra-Lift. Proper cleansing is key to younger healthier skin.